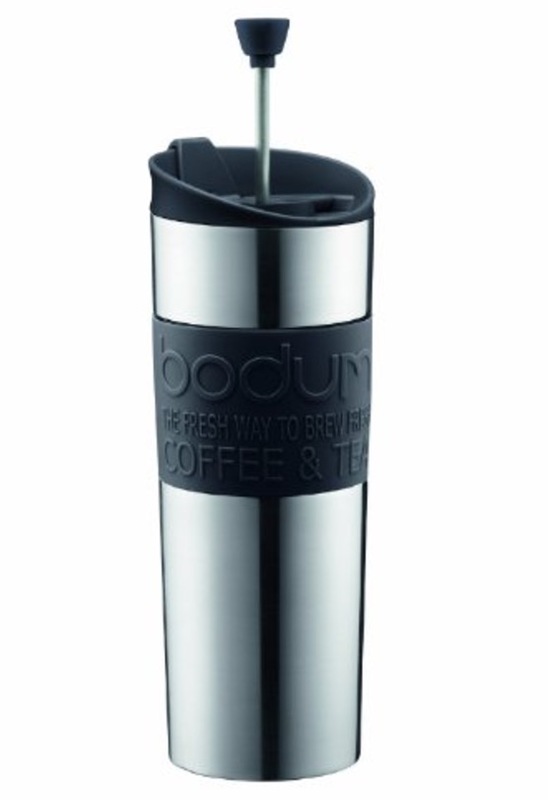 Life gets a lot better with this on-the-go French press by Bodum. The Bodum Travel coffee press is a must have coffee maker for those who love a strong cup of caffeine even when they’re in a hurry. This smart design allows you to turn your favorite bean into your favorite drink as you go rushing out the door for work or an important appointment. Bodum has been around for many years and they could be considered the masters of the business. This French press coffee press takes portable travel mugs to the next level. 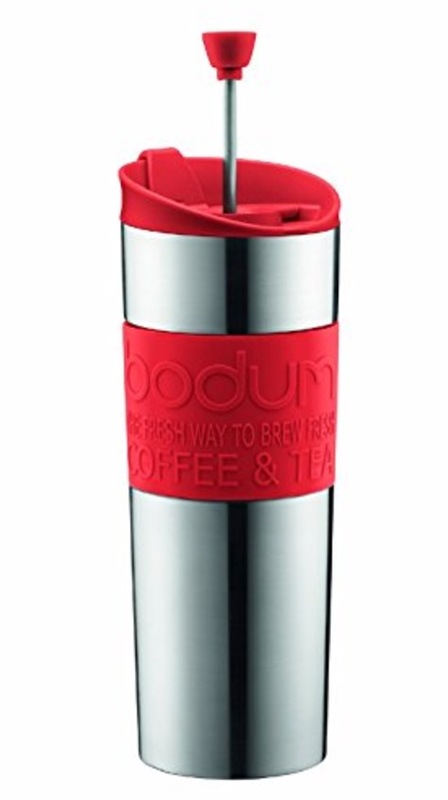 You can use this travel mug to brew both coffee and tea and it keeps it hot enough to enjoy while you’re on the move. 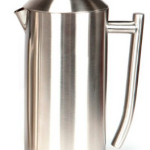 The mug itself is made of a double-wall construction stainless steel which keeps your drink hot or cold for many hours. You donèt have to worry about spilling because the lid fits snugly on top. 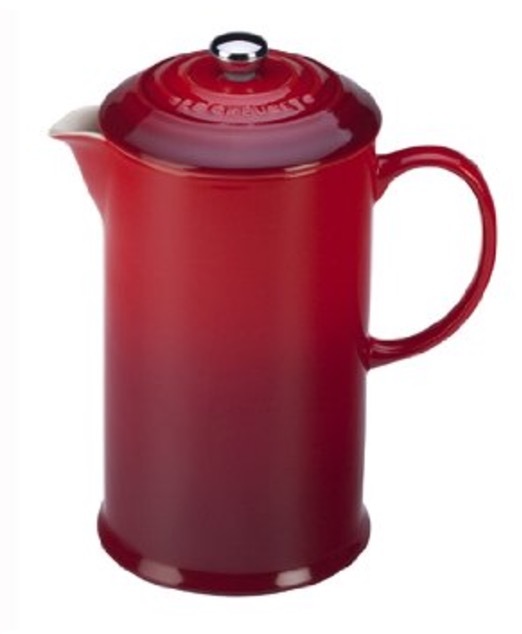 Included in the lid is the plunger system which allows you to enjoy your favorite hot drink. If you get this travel mug, here’s a few tips to guide you toward making a good coffee to take on the go. Step 1: Put the water on and bring it to a boil. Step 2: As you wait for the water to boil, start grinding the bean with your hand grinder. If you’re not sure how much coffee bean to use, keep this ratio in mind: 1:12 (coffee-to-water ratio). Step 3: Put the coffee into the Bodum and add the water slowly. Fill about halfway to allow the gases to be released. Give the coffee a little stir then continue filling with water until you reach the top. Step 4: Give the coffee a final stir then put on the lid. Step 5: At this time, you’re probably feeling pressed for time. That’s O.K. You can run out the door to wherever you need to be. Step 6: About 4 minutes into rush hour, you can press down the plunger and start to enjoy your coffee. This is the ideal situation. If you’re really pressed for time, you can simple use coffee already ground up and all you need is hot water. You can skip the stirring because your rush to your destination will stir it up the coffee for you. WHO NEEDS THIS TRAVEL FRENCH PRESS? If you enjoy the full flavor of the coffee bean and you find yourself pressed for time, this is certainly the best travel mug to get. The spill proof lid allow you to take this coffee and hurry to the office. It is also ideal for the avid mountain climber who wants to brew a cup and enjoy their drink at the top of their climb. 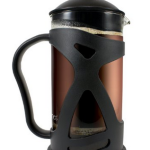 Ultimately, the Bodum travel press is a smart choice for any gift giving occasion. It’s no surprise that this coffee mug is great for the winter season. You can brew a cup in the morning and use the heat coming from the stainless steel bottom to keep your hands warm while waiting for the bus or walking to the train station. If it’s too hot to handle, you can hold onto the silicon grip and go about your day. This travel mug stays hot for hours and if you’re reading this in the summer season, you should stock up now and be prepared for the already forgotten winter ice. “Can’t say enough good things about this mug, and if you have two, they stack so you can carry both out to the car while keeping a hand free. Super high quality and does not spill. I’ll never go back to any of the other 30 designs I’ve tried,” said Heidi. Here is a travel mug that provides reliable and satisfying coffee for the busy person always on the go. The Bodum Travel Stainless Steel French Press makes for the perfect gift for friends, family, co-workers and especially yourself.